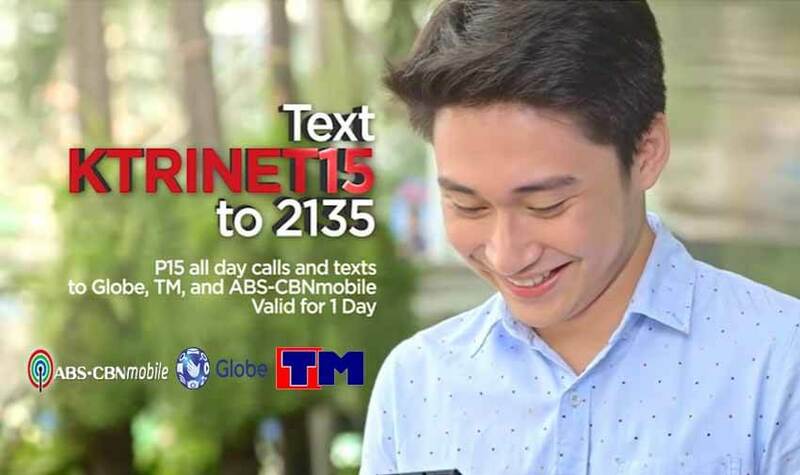 Did you see the latest ABS CBN Mobile TV commercial about their new trinet promo starred by Kapamilya Robi Domingo? In case you miss the good news, their network is now part of Globe and TM tri-net offers and they also announced their latest promo. You can now enjoy unlimited calls and texts when you register for their latest KTRINET15 offer that will let you connect to your friends and love ones who use Globe and Touch Mobile network. This promo already caters your communication needs, but if you want all in one texting you can choose to any of ABS CBN Mobile UnliText and Text to All Networks Promo depending your budget and needs. You can enroll to this promo via SMS, just reload your ABS CBN Mobile prepaid SIM card with a regular load amount of 15 pesos. You can also ask your load retailer if they can directly load it to your mobile number. We have provided the keyword, format and send to number for your registration reference if you prefer to register on your own. Wait for the SMS notification after you register and before you start using this promo to avoid regular load deduction. You can also do a balance inquiry to check your remaining load to make sure that your registration is successful. If you want to extend this promo for one more day, you need to reload your account again with the same amount and follow the mechanics above.